LONDON — (Opinion) There is nothing in this series of articles to deny that anti-Semitism is a real threat. On the contrary, the point is to expose the cheap use of the anti-Semitism card in the face of a real menace to society. Overused and undeserved allegations of anti-Semitism only endanger Jews like me should the real dangers of anti-Semitism rise again. 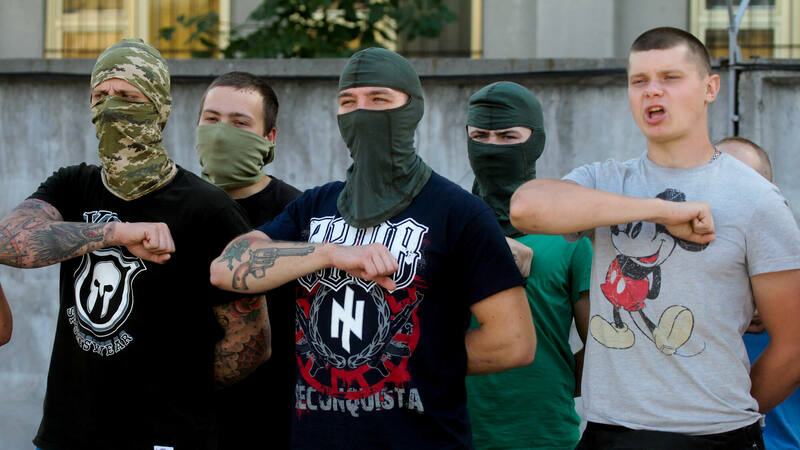 We are seeing Neo-Nazis rise in Ukraine, the Baltics, and even Germany. Ultranationalist far-right parties demonize all who stand in their way and, if they can get away with it, have a willingness to use violence on those who oppose them. Should their rise continue, anti-Semitism will follow. A real, violent form of anti-Semitism. This may leave a great many people to wonder why is there such intolerance of criticism of Israel when violence and oppression, most worryingly on a state level, appear to be returning. Such hate groups typically target vulnerable, minority populations in their rise to power. That is the history and the fundamental fear of anti-Semitism. Not criticism of Israel. While this clear and present danger is rising, false allegations of anti-Semitism are being used to silence critics of Israel and condemn politicians who might support the victims of Israel’s oppression. Thus the misuse of charges of anti-Semitism is coming exactly at the time when threats from real and violent anti-Semites are rising. The threat of anti-Semitism has always been based upon a form of xenophobia — a sense that Jews are somehow outsiders, even if their countries are the only homes they have ever known. With the rise of far-right parties using refugees as a scapegoat, will anti-Semitism be far behind? Few imagined that a mere 25 years later, it would be Western Europe and the United States drifting towards the xenophobic populism that triumphed first in Hungary and Poland, before moving westward toward France, the Netherlands, and the U.K. In the past ten years, new right-wing political movements have brought together coalitions of Neo-Nazis with mainstream free-market conservatives, normalizing political ideologies that in the past rightly caused alarm. While the new right-wing movements participate in electoral politics, many of them have unofficial links with vigilante groups that patrol their country’s borders, shake down immigrant businesses, and harass women in hijabs, and small armies of thugs that wait to pick fights at rallies. These groups do not live in fear of prosecution for hate crimes: they maintain Facebook pages and websites. The rise of this far-right extremism is happening in Europe and not just in isolated pockets. Across the Atlantic, the Southern Poverty Law Center identified 784 hate groups in the U.S. in 2014. In short, there seem to be a lot more serious forms of anti-Semitism rising, yet the focus of anti-Semitic allegations is on those challenging Israel’s oppression of Palestinians. For example, we will review the story of how a Canadian activist challenged two Canadian MPs for their support of Israel after the IDF had twice shot a Canadian doctor working to save lives during unarmed protests. This eventually led to another set of events during which the prime minister of Canada falsely called the activist an anti-Semite. We are doing everything we can to assist Dr. Loubani and his family, and to determine how a Canadian citizen came to be injured. We are engaging with Israeli officials to get to the bottom of these events. We wish to express our profound sorrow for the tragic deaths of civilians, including children and first responders. The injury of a Canadian emergency physician is troubling, and we wish him a speedy recovery and safe journey back to Canada. Let us for argument’s sake assume that the two MPs’ statement was factually correct. Even if Hamas had organized the demonstration, the fact remains that Israel used snipers beyond harm’s reach to massively kill and injure unarmed Palestinians. These two MPs appear to believe the magic word “Hamas” absolves Israel of any atrocity. Most striking though is that the MPs focus on defending Israel rather than a Canadian emergency doctor tending to the wounded. In addition, it had been well known that the organizers of the Great March of Return specifically excluded Hamas from their organizing. Considering how pervasive membership in Hamas is in Gaza, of course, members of Hamas participated, but Hamas was not involved in organizing. So in Canada, two MPs turned against their Liberal Party, their prime minister, and a Canadian doctor to defend Israel based upon the lies of Israeli narrative. Clearly, the loyalty of the two MPs is questionable. Keep the question of their loyalty in mind as the next series of events unfolds. For the anti-Semitism allegation is made to quash any discussion of those troubling events occurring within a democracy. The Canadian Union of Postal Workers (CUPW) has adopted a position in support of Palestinians. The pro-Israel organization B’nai B’rith then began to smear the CUPW. Pro-Palestinian rights groups then responded by organizing an August 29 demonstration to address the smears. The Jewish Defence League Canada (JDLC), a group that includes members who are disposed to violence, organized a counter-demonstration. And there we have the infamous IHRA definition of anti-Semitism used to silence a challenge to power that defends Israel. No mention that the central issue is that B’nai B’rith supporters called for the death of leading Canadian politicians and that other Canadian politicians of the same party refused to condemn these calls. No. The anti-Zionist leader of the CJPME — who brought to light these death threats, and the failure of the Liberal MPs to condemn them — is simply and directly called an anti-Semite. Remarkably, it gets more bizarre. Rather than condemn death threats by pro-Israel supporters, the two Liberal MPs stood aside quietly. This condoning silence, the comments after the shooting of Dr. Loubani, and many other actions that Yves Engler has reviewed in Mondoweissdemonstrate the two Liberal MPs’ support for Israel over Canadians. Yet by pointing out the questionable loyalty of the MP’s for not condemning the death threats, Lascaris is at fault for being anti-Semitic! This is how power uses the label of anti-Semitism to smear and squash dissent. Dissent against Israel and those defending its atrocities. (If readers seek more information, see Lascaris’s more detailed account of all the events here). J.K. Rowling, famous author of the Harry Potter series, has written a book where one of the fictional characters is an Israel-hating anti-Semite. More disturbing than a fictional character that reinforces the thought that anti-Zionism is really anti-Semitism, something Rowling has insinuated by tweet previously, the article that described the book shared a Twitter exchange between Rowling and Simon Maginn, a less prominent writer. To understand the significance of Rowling’s comments, we must first review Maginn’s Twitter exchange with Simon Myerson. As discussed in Part 1 of this series, when British pro-Israel advocates had challenged a professor after taking his ironic remarks literally, Jeremy Corbyn had suggested that the pro-Israel advocates did not understand irony. This was turned into an uproar to pillory Corbyn for saying that Jews were not quite English. When a witness says ‘let me make my thoughts clearer’ they mean, ‘let me alter what I said previously’. Most likely, Rowling did not follow the earlier exchange of tweets and only responded to Maginn’s demand for an answer without context. While the tone of Maginn’s last tweet could create an unfavorable impression, this lack of knowledge of the complete exchange is squarely on Rowling. There is no basis for Rowling to assert that Myerson, the person Maginn was addressing, was experiencing any “pain and fear.” Even if Myerson was suffering from pain or fear, such a state of mind is essential to support the allegation of Corbyn’s anti-Semitism. For the allegation is the perception of his remarks, not any subsequent actions. Rowling apparently believes that someone’s sense that Corbyn’s comments are anti-Semitic is unquestionable. Yes, others have made their views known, but Maginn was exchanging tweets with Myerson and Maginn’s demand for substantiation was directly of Myerson. Yet Rowling made it clear Maginn had no right to ask the question. When Maginn asked Rowling the same question about Corbyn’s remarks, she refused to answer that as well. Thus, according to Rowling, the allegation of anti-Semitism and the feelings of the person making such allegations is sufficient. The allegation itself does not have to be defended. The questioner ultimately is an anti-Semite (as Rowling subsequently more directly charged) for challenging the allegation of anti-Semitism. The result is that the leader of the Labour Party is alleged to be anti-Semitic and that he and any of his supporters shall have no right to challenge such allegations. Under such rules of engagement, who could survive the anti-Semite allegation? The smoking-gun email, sent Friday afternoon from an official ‘andrewcuomo.com’ account, suggested that the Post publish a story about Nixon’s support of the pro-Palestinian ‘Boycott, Divestment, Sanctions’ movement against Israel. ‘Nixon has supported insidious BDS campaign, signing onto letter boycotting Israel,’ it says. ‘Obviously something you guys have reported on a lot and right before the jewish high holidays! So now the anti-Semitism allegation is considered kosher for slimeball politics? Considering the growth of far-right, nativist movements, including specifically neo-Nazi ones, there are real threats to Jews in the West. Yet the concern over “anti-Semitism” is not focused on them. It is focused on protecting Israel. So much so that the slightest hint of anti-Zionism is immediately attacked as anti-Semitism. In fact, the anti-Semitism allegation has become a dangerous weapon. Yet wielding this weapon for marginal reasons and in anti-democratic, speech-infringing ways may well result in the broader public losing interest in protecting Jews from anti-Semitism. Let us not forget how small the Jewish population is in the West. Should the broader public decide it is no longer a reasonable concern, no movement of Jews in their home countries or in Israel could stop a rising storm. Yet there is a reason to be hopeful, and that is Judaism itself and the culture of its members. I saw this meme posted on Facebook with the question “Is this picture Hasbara 2.0?” Hasbara, as many already know, is the organized propaganda effort of the State of Israel. The meme might be something purposefully posted to improve the image of Israel. Yet, even if it is Hasbara, it proves the point that, just as before Zionism started its deadly course in Palestine, people of all faiths can live together peacefully. The meme shows that once people throw out labels of race and religion, there is a sense of caring about one another and living together in harmony. Only when leadership takes people down a path of greed and selfishness, do they create the zero-sum-game sense of entitlement of one group at another’s expense that leads to conflict. The more expansive the greed, the larger the conflict. Ethnic cleansing, land theft and occupation are as expansive as greed and supremacy can get. Yet Israel does not have to be that way. I am hopeful that Israel and its supporters will address all that has been discussed in this series and adopt the wonderful moral principles of Judaism upon which most Jews, including myself, have been raised. The same morality and harmony to which people of all faiths and heritages aspire. Given our own history of suffering, Jews are a compassionate people. We played a prominent role in the civil rights movement of the 50s and 60s. Many Jews still fight for justice today. Accordingly, I am hopeful that those who are working against this grain to maintain Jewish supremacy in Palestine can come back to the fold too. Ian Berman is an entrepreneur and former corporate banker at leading global banks in New York City. He now focuses on financial advisory services and writing about representative government, equitable public policies and ending American militarism and Israel’s continuing colonization of Palestine. He is the Co-Founder ofPalestine 365, the Ongoing Oppression and its predecessor,Palestine 365, on Facebook. In fact, there can be no rational explanation for Haley’s palpable hatred of Palestinians and Arabs, and love for Israel, other than sheer opportunism. The notion, that the U.N.’s supposed unfairness to Israel, was at the heart of Haley’s skewed discourse. In December 2017, the self-proclaimed anti-bullying diplomat threatened those who voted in favor of an Egypt-sponsored draft resolution that expressed “deep regret at recent decisions concerning the status of Jerusalem.” She vetoed the draft, which was supported by all other members of the Security Council, calling the vote an ‘insult’ that would not be forgotten. Soon after her resignation was announced, Danon spoke fondly of Haley for challenging ‘anti-Israel bias’ in the U.N. The U.S.-Israeli love affair at the U.N., and their ongoing war on Palestinian rights are likely to remain unchanged, long after Haley’s departure. Previous Post Photos: Japan’s ageing rice farmers shoulder an uncertain future……………..Photos: Islamic State fighters’ children in Iraq’s orphanages……………..Ιndia Lost and Found: An Instagram project is uncovering forgotten monuments……………….Photos: A chance discovery revives hopes for rare Choctaw horses…………. Next Post A Dying Race Couldn’t Influence The Defense Of Western Civilization…………………..The Croatian Role In The Destruction Of Yugoslavia In The 1990s…………………The Western “Math-Gangsters” And The Kosovization Of Macedonia…………………NATO’s Upcoming 40,000-soldier Arctic Drill Is A Message To Russia And China…………………The US Would Be Under Serious Hybrid War Threat If Mexico Legalized Opium………………….